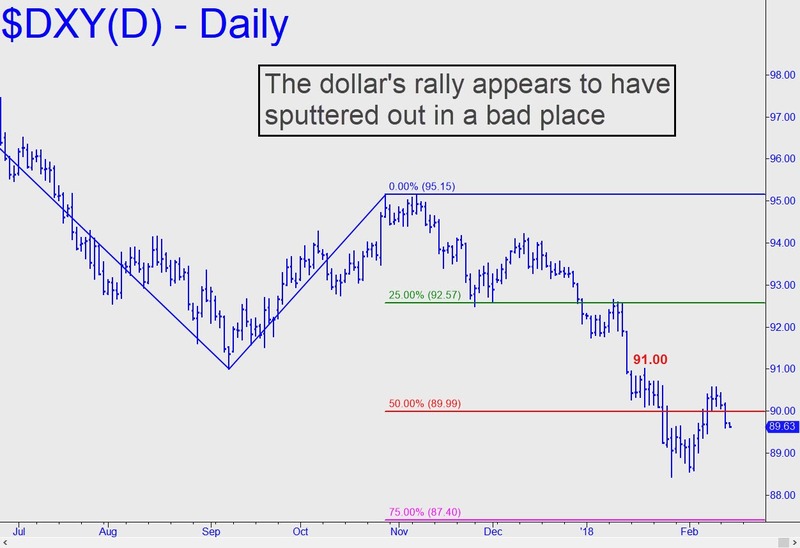 Dollar’s Rally Turning into a Dead-Cat Bounce? I wouldn’t give up on the dollar quite yet, but DXY appears to be rolling over without having surpassed any significant peaks on the daily chart. This is bearish price action. The January 26 low at 88.44 came within 15 cents of an 88.29 Hidden Pivot I’d drum-rolled as a place for a potentially important low. The dollar subsequently rallied to as high as 90.57, but as my latest DXY tout (below) makes clear, that’s not quite enough to refresh the bullish energy of the daily chart. Were the dollar to continue on its way lower, extending the mini-bear market begun from 103.82 in January 2017, stocks would likely resume an uptrend that seemed to have flourished on the effects, both psychological and real, of a weak dollar.